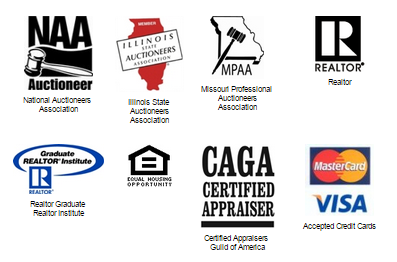 Ready to be a part of St. Louis based Father Time® Auctions and buy some property? This may be what you need in hand... See the Terms and Conditions of the sale. This letter will introduce (purchaser’s name) who is a valued customer of this bank. This bank will guarantee any checks drawn on this account # (insert account number) that are written by (insert your name) which are made payable to Father Time® Auctions and Real Estate; and is good for a period of thirty days from date of auction on (insert auction date) and for any amount up to (insert dollar amount). This letter covers the purchase of all merchandise offered by Father Time® Auctions and Real Estate on (insert date of auction). NOTE; PLEASE DON'T HESITATE TO CALL US AHEAD FOR QUESTIONS SO THAT WE CAN GLADLY APPROVE YOU FOR PARTICIPATION IN THE SALE - ESPECIALLY FOR WEEKEND EVENTS AS BANK SERVICES ARE LIMITED DURING THOSE DAYS.